About a year ago Pagani unveiled its plans to expand its brand to the Far East with the establishment of Pagani China Automotive Limited. 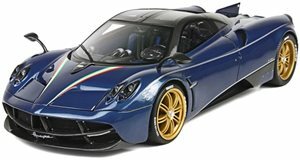 Pagani revealed that it was to release three limited edition Huayras to mark the official debut of its new Asian subsidiary. The limited Huayra, dubbed the “Dinastia” has a dragon theme, comes in either blue, gold or red, and is exclusively marketed to buyers in China and Macau. The car has a 6.0-liter AMG V12 engine that produces 700 hp and is capable of hitting 62 mph in 3.3 seconds with a top speed of 230 mph. The limited edition Chinese Huayra also comes with a hefty price tag of 29 million yuan ($4.58 million). Now, after plenty of anticipation, the big day finally arrived as the Huayra Dinastia was officially unveiled in Shanghai this past week at an exclusive VIP event. Horacio Pagani himself was in attendance and mingled with the VIPs.